It’s Halloween season, and you know that Wonder Woman is going to be one of the hot costumes. 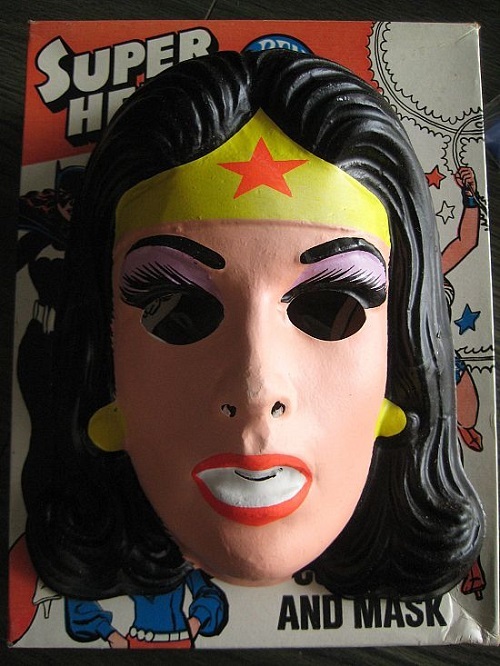 So let’s look at the history of Wonder Woman, and her influence on Halloween costumes. 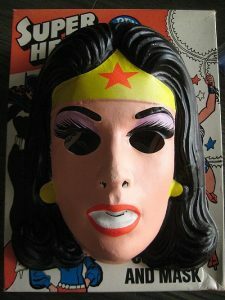 Wonder Woman’s costume was pretty risqué for the times. A bustier with an eagle, star-spangled short-shorts, and red high boots was not a typical woman’s outfit in the 40’s! (She originally wore a skirt, but it was too hard to draw). 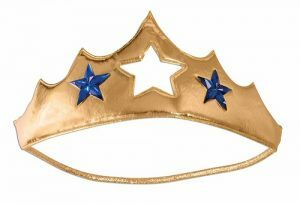 Wonder Woman’s outfit has varied over time, although almost all of her outfit incarnations have retained some form of breastplate, tiara, bracelets, and her signature five-pointed star symbols. Did you know that during the 60’s, they revamped the character; she lost her powers and opened a mod boutique! She wore jumpsuits during this time, and dressed (and fought ) like the Avengers’ Emma Peel. 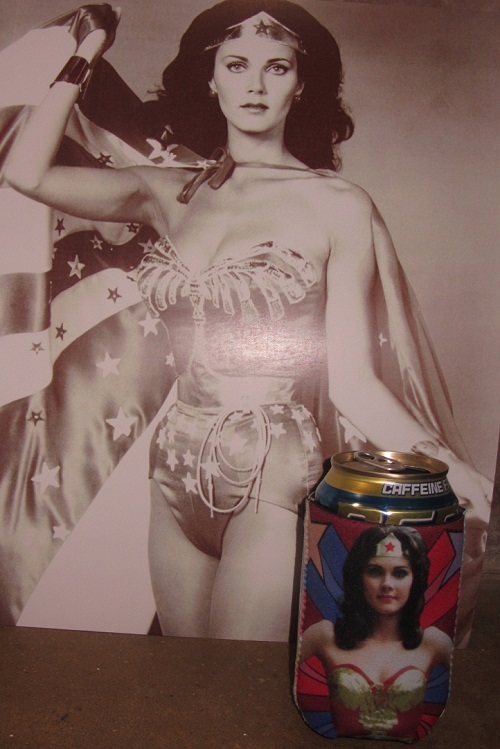 In the 70’s, we finally got a live action Wonder Woman in Lynda Carter. Her iconic TV series (1975 to 1979) was a big deal for little girls growing up back then. We all wanted to be Wonder Woman. So for Halloween, we could pick up one of those vinyl costumes with the plastic masks by Ben Cooper. It was not perfect, but we could pretend. 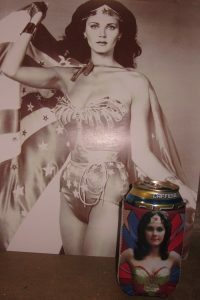 We still sell Lynda Carter Wonder Woman merchandise at Backward Glances. I just loved how she spun around and transformed into her Wonder Woman costume. In 1977, an even better way to be Wonder Woman came along: Underoos! You could wear them under your clothes all day long, just like a real super hero. 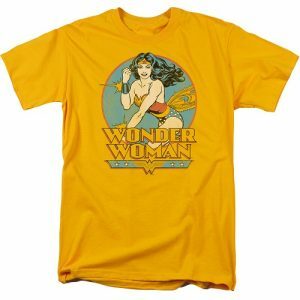 If you are a long time Backward Glances customer, you might remember when we sold vintage Wonder Woman Underoos in our Red Bank store back in the 90’s. I wish we still had some of these to sell. Now Wonder Woman’s outfit has changed again, with the new movie starring Gal Godot. She’s still got the eagle bustier and tiara, but her costume is much darker and no longer has the blue starred shorts. That’s not my Wonder Woman. 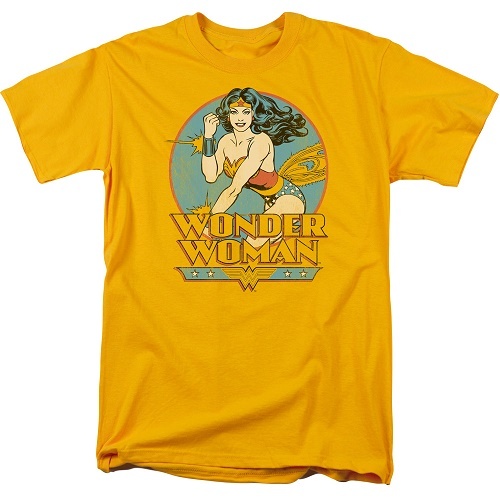 Here at Backward Glances, we can sell you a complete old school Wonder Woman costume. Or we can sell you a Wonder Woman tiara, two metal cuff bracelets, and a red cape. Put it together with a red bustier or red leotard, choose your own look, and be your own hero.